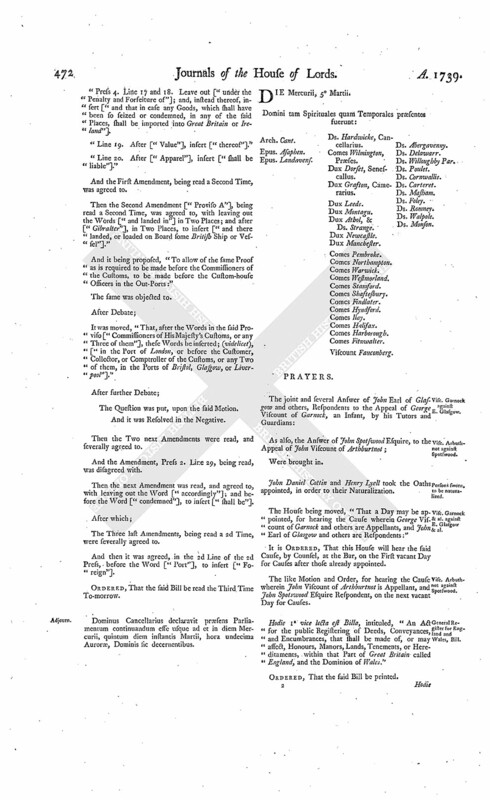 To return the Bill, intituled, "An Act for confirming and establishing an Exchange agreed upon between the Lord of the Manor and Rector of the Parish Church of Great Bircham, in the County of Norfolk; and for promoting and facilitating an Enclosure intended to be made, of divers Commons, Common Pasture, and Waste Grounds, lying in the said Parish of Great Bircham;" and to acquaint this House, that they have agreed to the same, without any Amendment. To return the Bill, intituled, "An Act for naturalizing Anthony Vazielle and Stephen Saintandre;" and to acquaint this House, that they have agreed to their Lordships Amendments made thereto. Kensington, &c. Road, repairing, Bill. 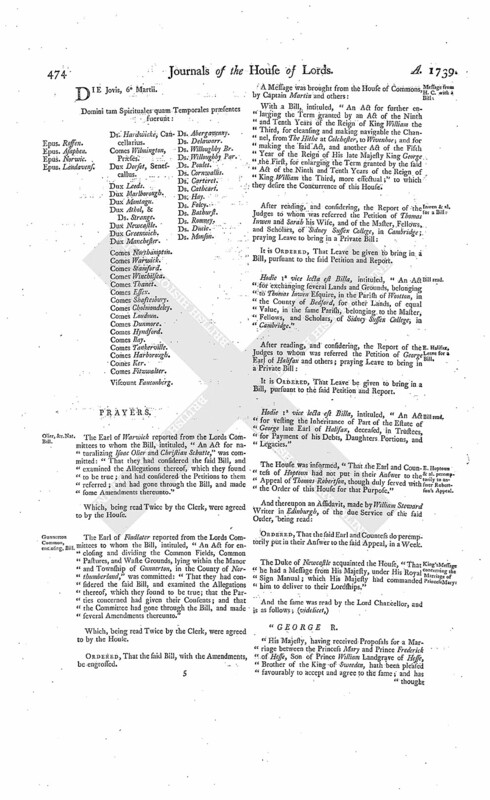 With a Bill, intituled, "An Act for enlarging the Term and Powers granted by an Act made in the Twelfth Year of the Reign of His late Majesty King George, intituled, "An Act for repairing the Roads, in the Parishes of Kensington, Chelsea, and Fulham, and other Parishes therein mentioned, in the County of Middlesex; and for repairing some other Roads, in the Parish of St. George, Hanover Square, and the said Parishes of Kensington and Chelsea;" to which they desire the Concurrence of this House. With a Bill, intituled, "An Act for naturalizing Isaac Olier and Christian Schutte;" to which they desire the Concurrence of this House. The Two last mentioned Bills were read the First Time. Cottin, &c. Petition to be added to it. Were severally presented to the House, and read; praying to be added to the last mentioned Bill. Ordered, That the said Petitions do lie on the Table, till the said Bill be read a Second Time. Grierson to sue notwithstanding his Attainder, Bill. The Earl of Findlater reported from the Lords Committees to whom the Bill, intituled, "An Act to enable William Grierson, the Eldest Son of Sir Robert Grierson of Lag Baronet, to sue, or maintain any Action or Suit, notwithstanding his Attainder; and to remove any Disability in him, by reason of his said Attainder, to take or inherit any Real or Personal Estate, that may have descended or otherwise come to him, since His Majesty's most Gracious Pardon, dated the 29th Day of June, in the 11th Year of His Reign, or that shall hereafter descend or otherwise come to him," was committed: "That they had considered the said Bill, and examined the Allegations thereof, which they found to be true; and that the Committee had gone through the Bill, and directed him to report the same to the House, without any Amendment." The Lord Lovell presented to the House a Bill, intituled, "An Act for confirming and enlarging the Powers granted by His Majesty to the Governors and Guardians of the Hospital for the Maintenance and Education of exposed and deserted young Children, by His most Gracious Charter, bearing Date the 17th Day of October in the Year of our Lord One Thousand Seven Hundred and Thirty-nine; and to enable them to execute the good Purposes of the said Charter." Public Register for England and Wales, Bill. 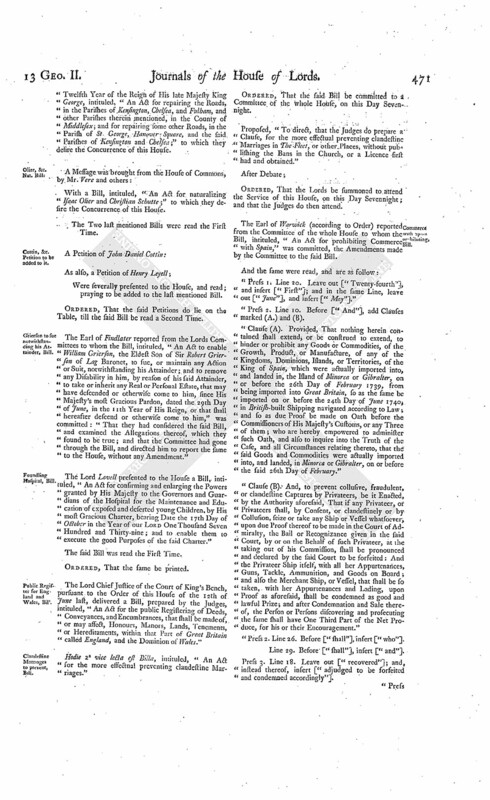 The Lord Chief Justice of the Court of King's Bench, pursuant to the Order of this House of the 12th of June last, delivered a Bill, prepared by the Judges, intituled, "An Act for the public Registering of Deeds, Conveyances, and Encumbrances, that shall be made of, or may affect, Honours, Manors, Lands, Tenements, or Hereditaments, within that Part of Great Britain called England, and the Dominion of Wales." Clandestine Marriages to prevent, Bill. Hodie 2a vice lecta est Billa, intituled, "An Act for the more effectual preventing clandestine Marriages." Proposed, "To direct, that the Judges do prepare a Clause, for the more effectual preventing clandestine Marriages in The Fleet, or other Places, without publishing the Bans in the Church, or a Licence first had and obtained." Ordered, That the Lords be summoned to attend the Service of this House, on this Day Sevennight; and that the Judges do then attend. The Earl of Warwick (according to Order) reported from the Committee of the whole House to whom the Bill, intituled, "An Act for prohibiting Commerce with Spain," was committed, the Amendments made by the Committee to the said Bill. "Press 1. Line 20. Leave out ["Twenty-fourth"], and insert ["First"]; and in the same Line, leave out ["June"], and insert ["May"]." "Press 2. Line 10. Before ["And"], add Clauses marked (A.) and (B). "Clause (A). 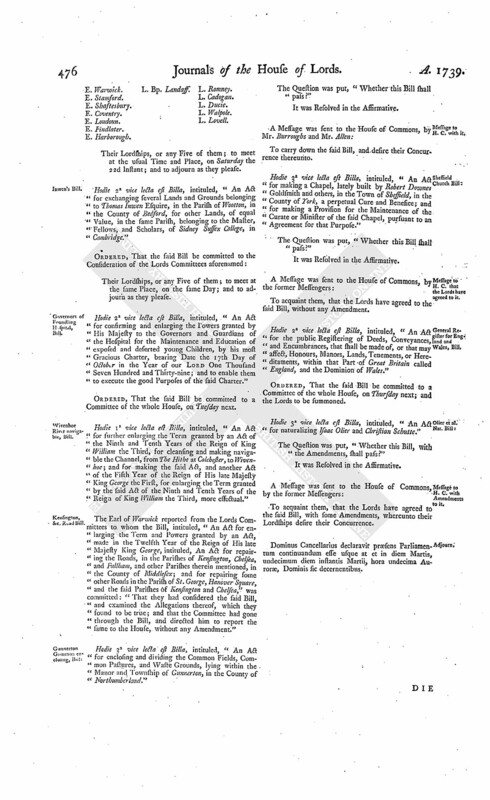 Provided, That nothing herein contained shall extend, or be construed to extend, to hinder or prohibit any Goods or Commodities, of the Growth, Product, or Manufacture, of any of the Kingdoms, Dominions, Islands, or Territories, of the King of Spain, which were actually imported into, and landed in, the Island of Minorca or Gibralter, on or before the 26th Day of February 1739, from being imported into Great Britain, so as the same be imported on or before the 24th Day of June 1740, in British built Shipping navigated according to Law; and so as due Proof be made on Oath before the Commissioners of His Majesty's Customs, or any Three of them; who are hereby empowered to administer such Oath, and also to inquire into the Truth of the Case, and all Circumstances relating thereto, that the said Goods and Commodities were actually imported into, and landed, in Minorca or Gibralter, on or before the said 26th Day of February." "Clause (B). 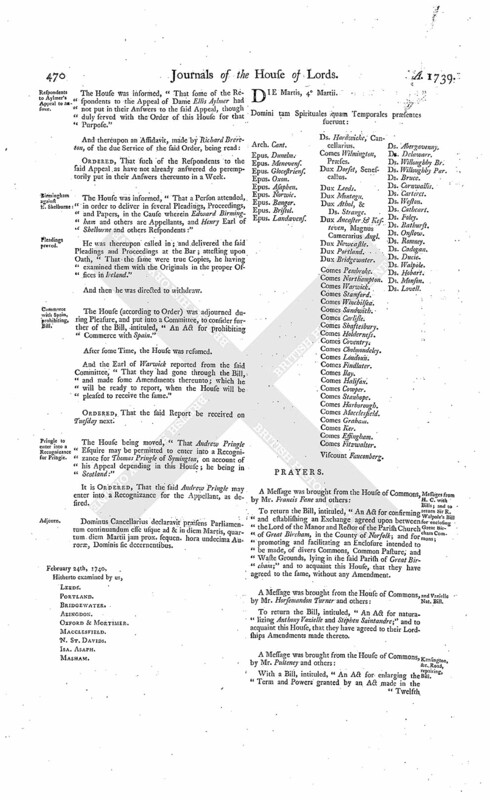 And, to prevent collusive, fraudulent, or clandestine Captures by Privateers, be it Enacted, by the Authority aforesaid, That if any Privateer, or Privateers shall, by Consent, or clandestinely or by Collusion, seize or take any Ship or Vessel whatsoever, upon due Proof thereof to be made in the Court of Admiralty, the Bail or Recognizance given in the said Court, by or on the Behalf of such Privateer, at the taking out of his Commission, shall be pronounced and declared by the said Court to be forfeited: And the Privateer Ship itself, with all her Appurtenances, Guns, Tackle, Ammunition, and Goods on Board; and also the Merchant Ship, or Vessel, that shall be so taken, with her Appurtenances and Lading, upon Proof as aforesaid, shall be condemned as good and lawful Prize; and after Condemnation and Sale thereof, the Person or Persons discovering and prosecuting the same shall have One Third Part of the Net Produce, for his or their Encouragement." "Press 2. Line 26. Before ["shall"], insert ["who"]. Line 29. Before ["shall"], insert ["and"]. Press 3. Line 18. Leave out ["recovered"]; and, instead thereof, insert ["adjudged to be forfeited and condemned accordingly"]. "Press 4. Line 17 and 18. Leave out ["under the Penalty and Forfeiture of"]; and, instead thereof, insert ["and that in case any Goods, which shall have been so seized or condemned, in any of the said Places, shall be imported into Great Britain or Ireland"]. "Line 19. After ["Value"], insert ["thereof"]." "Line 20. After ["Apparel"], insert ["shall be liable"]." And the First Amendment, being read a Second Time, was agreed to. Then the Second Amendment ["Proviso A"], being read a Second Time, was agreed to, with leaving out the Words ["and landed in"] in Two Places; and after ["Gibralter"], in Two Places, to insert ["and there landed, or loaded on Board some British Ship or Vessel"]." And it being proposed, "To allow of the same Proof as is required to be made before the Commissioners of the Customs, to be made before the Custom-house Officers in the Out-Ports:"
It was moved, "That, after the Words in the said Proviso ["Commissioners of His Majesty's Customs, or any Three of them"], these Words be inserted; (videlicet), ["in the Port of London, or before the Customer, Collector, or Comptroller of the Customs, or any Two of them, in the Ports of Bristol, Glasgow, or Liverpool"]." Then the Two next Amendments were read, and severally agreed to. And the Amendment, Press 2. Line 29, being read, was disagreed with. 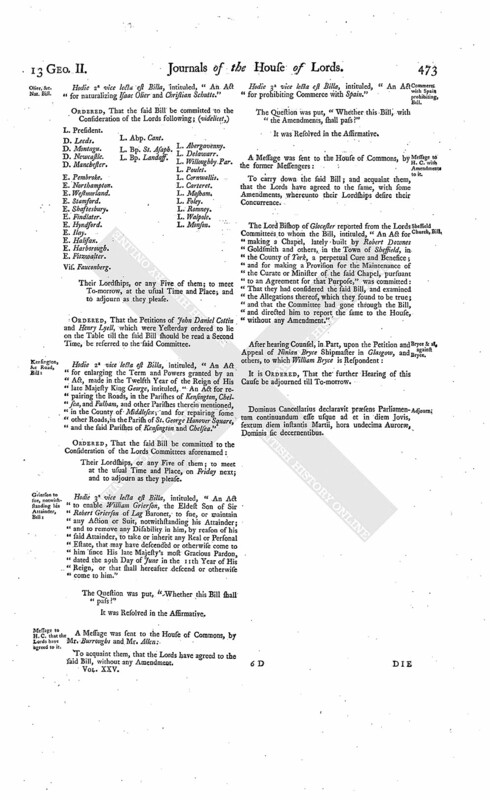 Then the next Amendment was read, and agreed to, with leaving out the Word ["accordingly"]; and before the Word ["condemned"], to insert ["shall be"]. The Three last Amendments, being read a 2d Time, were severally agreed to. And then it was agreed, in the 2d Line of the 2d Press, before the Word ["Port"], to insert ["Foreign"]. Dominus Cancellarius declaravit præsens Parliamentum continuandum esse usque ad et in diem Mercurii, quintum diem instantis Martii, hora undecima Auroræ, Dominis sic decernentibus. Visc. Garnock against E. Glasgow. John Daniel Cottin and Henry Lyell took the Oaths appointed, in order to their Naturalization. The House being moved, "That a Day may be appointed, for hearing the Cause wherein George Viscount of Garnock and others are Appellants, and John Earl of Glasgow and others are Respondents:"
The like Motion and Order, for hearing the Cause wherein John Viscount of Arthburtnot is Appellant, and John Spotswood Esquire Respondent, on the next vacant Day for Causes. Hodie 1a vice lecta est Billa, intituled, "An Act for the public Registering of Deeds, Conveyances, and Encumbrances, that shall be made of, or may affect, Honours, Manors, Lands, Tenements, or Hereditaments, within that Part of Great Britain called England, and the Dominion of Wales." Hodie 2a vice lecta est Billa, intituled, "An Act for naturalizing Isaac Olier and Christian Schutte." Ordered, That the Petitions of John Daniel Cottin and Henry Lyell, which were Yesterday ordered to lie on the Table till the said Bill should be read a Second Time, be referred to the said Committee. Hodie 2a vice lecta est Billa, intituled, "An Act for enlarging the Term and Powers granted by an Act, made in the Twelfth Year of the Reign of His late Majesty King George, intituled, "An Act for repairing the Roads, in the Parishes of Kensington, Chelsea, and Fulham, and other Parishes therein mentioned, in the County of Middlesex; and for repairing some other Roads, in the Parish of St. George Hanover Square, and the said Parishes of Kensington and Chelsea." Hodie 3a vice lecta est Billa, intituled, "An Act to enable William Grierson, the Eldest Son of Sir Robert Grierson of Lag Baronet, to sue, or maintain any Action or Suit, notwithstanding his Attainder; and to remove any Disability in him, by reason of his said Attainder, to take or inherit any Real or Personal Estate, that may have descended or otherwise come to him since His late Majesty's most Gracious Pardon, dated the 29th Day of June in the 11th Year of His Reign, or that shall hereafter descend or otherwise come to him." Hodie 3a vice lecta est Billa, intituled, "An Act for prohibiting Commerce with Spain." 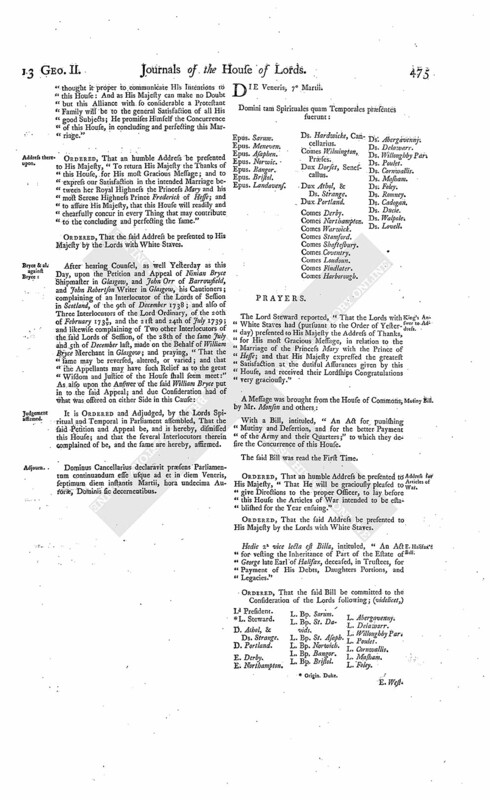 The Lord Bishop of Glocester reported from the Lords Committees to whom the Bill, intituled, "An Act for making a Chapel, lately built by Robert Downes Goldsmith and others, in the Town of Sheffield, in the County of York, a perpetual Cure and Benefice; and for making a Provision for the Maintenance of the Curate or Minister of the said Chapel, pursuant to an Agreement for that Purpose," was committed: That they had considered the said Bill, and examined the Allegations thereof, which they found to be true; and that the Committee had gone through the Bill, and directed him to report the same to the House, without any Amendment." Dominus Cancellarius declaravit præsens Parliamentum continuandum esse usque ad et in diem Jovis, sextum diem instantis Martii, hora undecima Auroræ, Dominis sic decernentibus. The Earl of Warwick reported from the Lords Committees to whom the Bill, intituled, "An Act for naturalizing Isaac Olier and Christian Schutte," was committed: "That they had considered the said Bill, and examined the Allegations thereof, which they found to be true; and had considered the Petitions to them referred; and had gone through the Bill, and made some Amendments thereunto." The Earl of Findlater reported from the Lords Committees to whom the Bill, intituled, "An Act for enclosing and dividing the Common Fields, Common Pastures, and Waste Grounds, lying within the Manor and Township of Gunnerton, in the County of Northumberland," was committed: "That they had considered the said Bill, and examined the Allegations thereof, which they found to be true; that the Parties concerned had given their Consents; and that the Committee had gone through the Bill, and made several Amendments thereunto." With a Bill, intituled, "An Act for further enlarging the Term granted by an Act of the Ninth and Tenth Years of the Reign of King William the Third, for cleansing and making navigable the Channel, from The Hithe at Colchester, to Wivenhoe; and for making the said Act, and another Act of the Fifth Year of the Reign of His late Majesty King George the First, for enlarging the Term granted by the said Act of the Ninth and Tenth Years of the Reign of King William the Third, more effectual;" to which they desire the Concurrence of this House. Hodie 1a vice lecta est Billa, intituled, "An Act for exchanging several Lands and Grounds, belonging to Thomas Inwen Esquire, in the Parish of Wootton, in the County of Bedford, for other Lands, of equal Value, in the same Parish, belonging to the Master, Fellows, and Scholars, of Sidney Sussex College, in Cambridge." E. Halifax, Leave for a Bill. Hodie 1a vice lecta est Billa, intituled, "An Act for vesting the Inheritance of Part of the Estate of George late Earl of Halifax, deceased, in Trustees, for Payment of his Debts, Daughters Portions, and Legacies." E. Hoptoun & al. peremptorily to answer Robertson's Appeal. The House was informed, "That the Earl and Countess of Hoptoun had not put in their Answer to the Appeal of Thomas Robertson, though duly served with the Order of this House for that Purpose." Ordered, That the said Earl and Countess do peremptorily put in their Answer to the said Appeal, in a Week. "His Majesty, having received Proposals for a Marriage between the Princess Mary and Prince Frederick of Hesse, Son of Prince William Landgrave of Hesse, Brother of the King of Sweeden, hath been pleased favourably to accept and agree to the same; and has thought it proper to communicate His Intentions to this House: And as His Majesty can make no Doubt but this Alliance with so considerable a Protestant Family will be to the general Satisfaction of all His good Subjects; He promises Himself the Concurrence of this House, in concluding and perfecting this Marriage." Ordered, That an humble Address be presented to His Majesty, "To return His Majesty the Thanks of this House, for His most Gracious Message; and to express our Satisfaction in the intended Marriage between her Royal Highness the Princess Mary and his most Serene Highness Prince Frederick of Hesse; and to assure His Majesty, that this House will readily and chearfully concur in every Thing that may contribute to the concluding and perfecting the same." It is Ordered and Adjudged, by the Lords Spiritual and Temporal in Parliament assembled, That the said Petition and Appeal be, and is hereby, dismissed this House; and that the several Interlocutors therein complained of be, and the same are hereby, affirmed. Dominus Cancellarius declaravit præsens Parliamentum continuandum esse usque ad et in diem Veneris, septimum diem instantis Martii, hora undecima Auroræ, Dominis sic decernentibus. The Lord Steward reported, "That the Lords with White Staves had (pursuant to the Order of Yesterday) presented to His Majesty the Address of Thanks, for His most Gracious Message, in relation to the Marriage of the Princess Mary with the Prince of Hesse; and that His Majesty expressed the greatest Satisfaction at the dutiful Assurances given by this House, and received their Lordships Congratulations very graciously." Address for Articles of War. Ordered, That an humble Address be presented to His Majesty, "That He will be graciously pleased to give Directions to the proper Officer, to lay before this House the Articles of War intended to be established for the Year ensuing." Hodie 2a vice lecta est Billa, intituled, "An Act for vesting the Inheritance of Part of the Estate of George late Earl of Halifax, deceased, in Trustees, for Payment of His Debts, Daughters Portions, and Legacies." D. Athol, & Ds. Strange. E. Harborough. L. Bp. Sarum. Their Lordships, or any Five of them; to meet at the usual Time and Place, on Saturday the 22d Instant; and to adjourn as they please. Hodie 2a vice lecta est Billa, intituled, "An Act for exchanging several Lands and Grounds belonging to Thomas Inwen Esquire, in the Parish of Wootton, in the County of Bedford, for other Lands, of equal Value, in the same Parish, belonging to the Master, Fellows, and Scholars, of Sidney Sussex College, in Cambridge." Their Lordships, or any Five of them; to meet at the same Place, on the same Day; and to adjourn as they please. Hodie 2a vice lecta est Billa, intituled, "An Act for confirming and enlarging the Powers granted by His Majesty to the Governors and Guardians of the Hospital for the Maintenance and Education of exposed and deserted young Children, by his most Gracious Charter, bearing Date the 17th Day of October in the Year of our Lord One Thousand Seven Hundred and Thirty-nine; and to enable them to execute the good Purposes of the said Charter." Hodie 1a vice lecta est Billa, intituled, "An Act for further enlarging the Term granted by an Act of the Ninth and Tenth Years of the Reign of King William the Third, for cleansing and making navigable the Channel, from The Hithe at Colchester, to Wivenhoe; and for making the said Act, and another Act of the Fifth Year of the Reign of His late Majesty King George the First, for enlarging the Term granted by the said Act of the Ninth and Tenth Years of the Reign of King William the Third, more effectual." The Earl of Warwick reported from the Lords Committees to whom the Bill, intituled, "An Act for enlarging the Term and Powers granted by an Act, made in the Twelfth Year of the Reign of His late Majesty King George, intituled, An Act for repairing the Roads, in the Parishes of Kensington, Chelsea, and Fullham, and other Parishes therein mentioned, in the County of Middlesex; and for repairing some other Roads in the Parish of St. George, Hanover Square, and the said Parishes of Kensington and Chelsea," was committed: "That they had considered the said Bill, and examined the Allegations thereof, which they found to be true; and that the Committee had gone through the Bill, and directed him to report the same to the House, without any Amendment." Hodie 3a vice lecta est Billa, intituled, "An Act for enclosing and dividing the Common Fields, Common Pastures, and Waste Grounds, lying within the Manor and Township of Gunnerton, in the County of Northumberland." Hodie 3a vice lecta est Billa, intituled, "An Act for making a Chapel, lately built by Robert Downes Goldsmith and others, in the Town of Sheffield, in the County of York, a perpetual Cure and Benefice; and for making a Provision for the Maintenance of the Curate or Minister of the said Chapel, pursuant to an Agreement for that Purpose." Hodie 2a vice lecta est Billa, intituled, "An Act for the public Registering of Deeds, Conveyances, and Encumbrances, that shall be made of, or that may affect, Honours, Manors, Lands, Tenements, or Hereditaments, within that Part of Great Britain called England, and the Dominion of Wales." Ordered, That the said Bill be committed to a Committee of the whole House, on Thursday next; and the Lords to be summoned. Hodie 3a vice lecta est Billa, intituled, "An Act for naturalizing Isaac Olier and Christian Schutte." Dominus Cancellarius declaravit præsens Parliamentum continuandum esse usque at et in diem Martis, undecimum diem instantis Martii, hora undecima Auroræ, Dominis sic decernentibus.